I bought a mineral water bottle at convenience store near 8tokyo office. You can drink just water or drop herbs’ little bag in that. 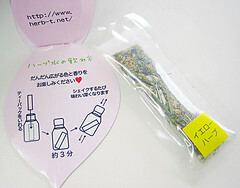 This is “yellow herb brend”.drop herbs’ bag in, next, leave the bottle 3 min. then shake it!